Iceland: "we are fed with lies"
It is a measure of how far behind I am lagging that only now am I getting round to writing up the second meeting of this tour, when my host and guide Björn Bjarnason took me to see the quite remarkable Erna Bjarnadóttir, chief economist of the Farmers Association of Iceland. 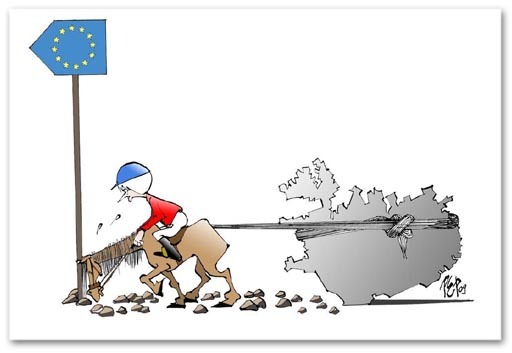 The cartoon, which represents the wild enthusiasm with which the farmers have been dragged towards the warm embrace of Mother Europe is taken from a Masters Thesis by Dutchman Bart Joachim Bes, on Iceland's abortive bid to join the EU, one that started on 16 July 2009 and is currently in abeyance with no sign of going anywhere. Fortunately, for me, our meeting with Erna was a relatively easy process of being taken through a pre-prepared statement by the Association, for which there is an English translation online, thus saving me from having to take detailed notes. Actually, I wish I had taken more notes as I was slow to realise that much of Erna's comments were unscripted. One is used to tales of bad faith, double-dealing, breach of confidences and outright treachery and one wondered what her own government had to offer. "We are fed with lies, said Erna, in one of the few verbatim comments I wrote down, as she settled the "fools of liars?" issue. Even allowing for my Jesuitical casuistry, where I insist that the lie is defined by the intent not the action, Erna was in no doubt. During the discussions, she says, information from the government on the progress and objectives of the negotiation was "misleading". "Misinformation was driving the discussions", she adds. The scenario put to the Icelandic government by Olle Rhen, then enlargement commissioner in charge of the negotiators, was just as misleading. There were 35 sections or "chapters" to the negotiations, and he argued that, if they could be treated as a marathon race, Iceland had already completed 40km. You are "nearly there" the government was told. However, the two outstanding chapters comprised farming and fishing, and both sectors had made their opposition implacably clear, presenting insurmountable barriers. We felt we were being salami-sliced, Erna observed. The farmers had, in fact, drawn up "red lines" – a list of seven minimum demands, requiring permanent exemptions to fundamental provisions of the Treaties. Worryingly, it took the farmers to set out these demands. Although the minister of agriculture, Jón Bjarnason, then accepted the red lines as his position, the government as a whole never did. Never did the government set out in public what its minimum demands were, and what it would be prepared to accept. As the negotiations progressed, it became clear that the EU was simply not going to make the necessary concessions. Nor was there any real expectation that they might. The farmers were under no illusions that what they were demanding was incompatible with EU treaty law. Yet, while the government was saying that it supported the farmer's demands, it was also making light of any difficulties, giving the impression that the hurdles could be overcome. There thus prevailed the deepest distrust as the government itself never made it clear what precisely the position was, and what it might be prepared to accept, other than it was willing to go over the heads of the farmers. "What sort of government is prepared to sell out their farmers, just to join the EU? ", Erna asked. She gave no indications of needing an answer. But, even with little expectations of fair dealing, the farmers accepted invitations to take part in all the "negotiation groups“ they were asked to join later in late 2012 were forced to walk out of a meeting when it seemed that their red lines of tariffs had been broken. Meamwhile in March 2011, the farmers issued a declaration, setting out their position. The Icelandic Farmers Forum, it said, "affirms its opposition to membership of the European Union. Enormous sector interests of the farmer community are at stake and the farmers forum considers those interests better safeguarded outside the Union". "The interests and livelihoods of farmers are inextricably connected to the interests of Icelandic consumers and the interests of the rural areas of Iceland", the statement continued. "The Forum is of the opinion that the country's food security can only be fully safeguarded by ensuring that Iceland will stay outside the European Union". From then to now, nothing has changed to vary the stance of the farmers. Agriculture in Iceland still retains its special position and resistance to joining the EU remains implacable. EEA membership gives them the market access they need, and there is no immediate intention to return to the table. Mind you, as long as Erna Bjarnadóttir is guarding the ramparts, if I was the Icelandic government, I wouldn't even bother trying.